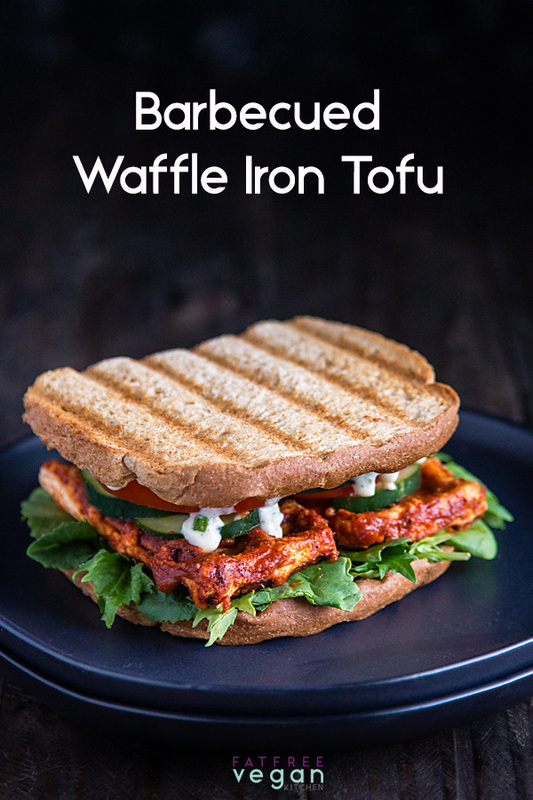 Tofu is coated in sugar-free barbecue sauce and then quick-cooked on a waffle iron for the chewiest, most flavorful tofu in under 10 minutes. 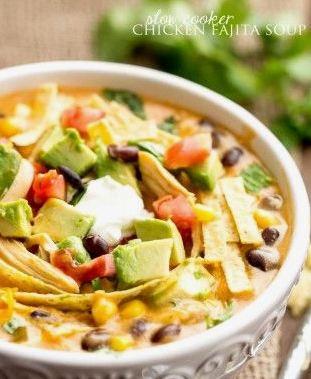 Welcome to tofu of the month! Just kidding, mostly, but since my second-to-last post was Air Fried Tofu Italian Style, you may start to think that I eat nothing but tofu. The one caveat I can think of is if you start with tofu that is too thin or cook it too long. You might then have tofu I would describe as “tough.” But as long as you shoot for slices of tofu that are about 1/2-inch thick, I don’t think you’ll have that problem. 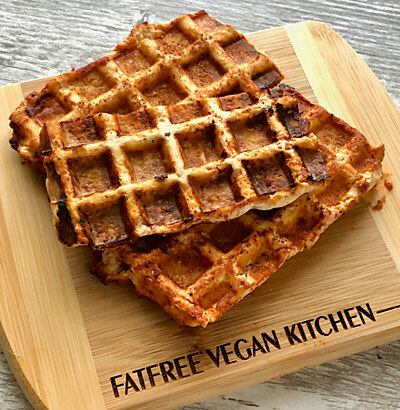 Much of the waffle iron tofu I’ve seen on the internet looks rather plain, as though people were planning to eat it like waffles or as a low-carb substitute for bread. I wasn’t interested in either of those options. I wanted barbecued waffle iron tofu for sandwiches, but I also wanted to avoid the sugar in traditional barbecue sauce, so I wound up making my own from a bottle of unsweetened ketchup I’m trying to use up. I’m struggling to use this ketchup up not because I like it but because I don’t. 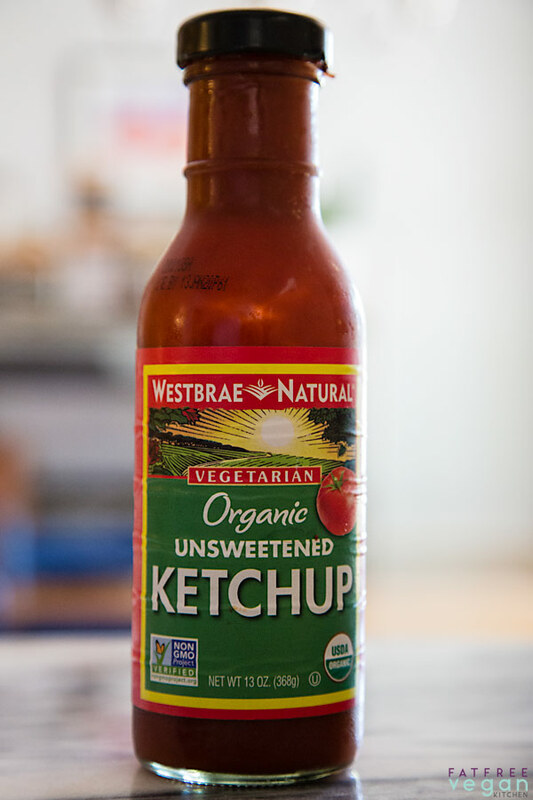 It turns out that I really don’t like ketchup unless its sweetened, and I was very sad when I put this stuff on a burger. Ick. Turns out I’d rather have no ketchup that unsweetened. I’ve made this twice now, and I’m amazed at how easy it is to make tofu that tastes like it’s been pressed and marinated for hours. I do give it a short press with my hands between paper towels before coating with sauce, but it marinates only for the few minutes it takes to heat up my George Forman grill with waffle iron plates installed. 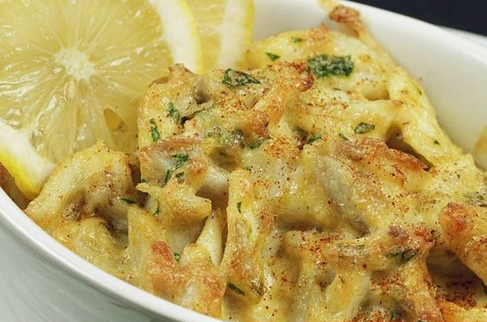 Best of all, you can use any sauce you want. Right after I made the batch you see pictured here, my daughter decided to make her own version. 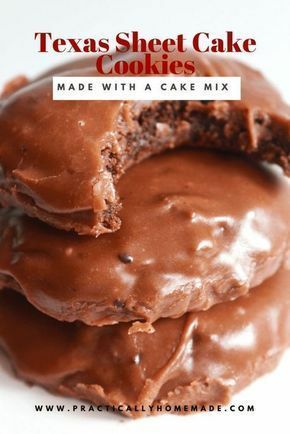 She used bottled barbecue sauce mixed with peanut butter, soy sauce, and sesame oil. She let me have a bite, and it was amazing. 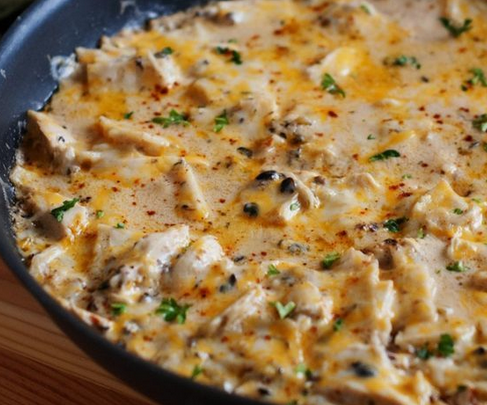 As long as what you’re coating the tofu with isn’t super-sticky, it should work well. 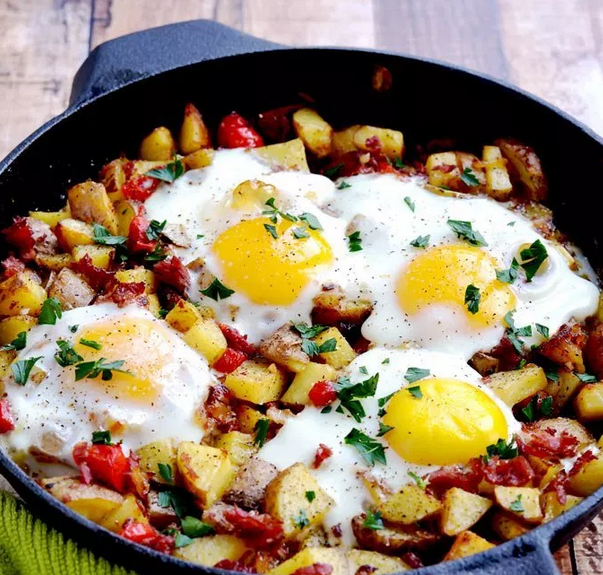 Try my Waffle Iron Hash Browns. 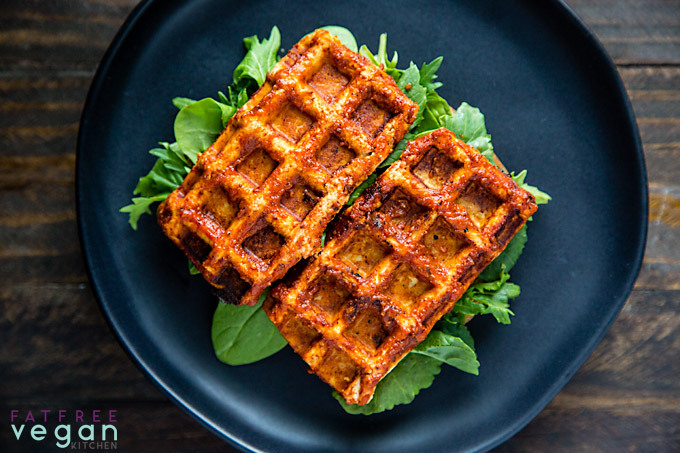 Tofu is coated in a sugar-free barbecue sauce and then quick-cooked on a waffle iron for the chewiest, most flavorful tofu in under 10 minutes. Use this sauce or any sauce you like. The sky's the limit! Drain the tofu and cut it into 3-4 equally thick pieces lengthwise. Place it on paper towels or a clean tea towel, cover it with the same, and press gently with your hands to remove some of the water. On a shallow plate, mix the ketchup or tomato sauce with the barbecue rub, soy sauce, and mustard. Combine well and add stevia or other sweetener a tiny pinch at a time until you like the sweetness. 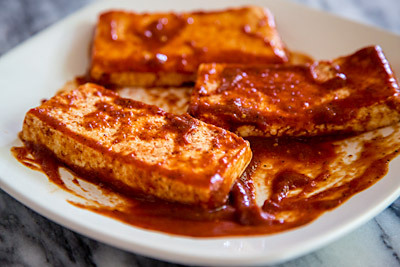 Drag each piece of tofu through the sauce until it's coated on all sides. Preheat your waffle iron on its highest setting. 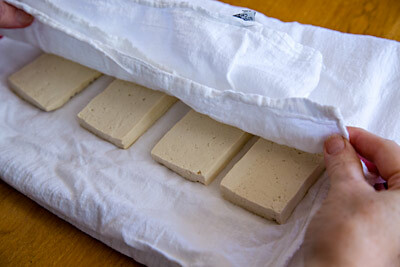 Once it is hot, place the tofu on the iron, distributing it equally. (Save the extra sauce to serve with the tofu.) Gently close the waffle iron and set a timer for 4-5 minutes. 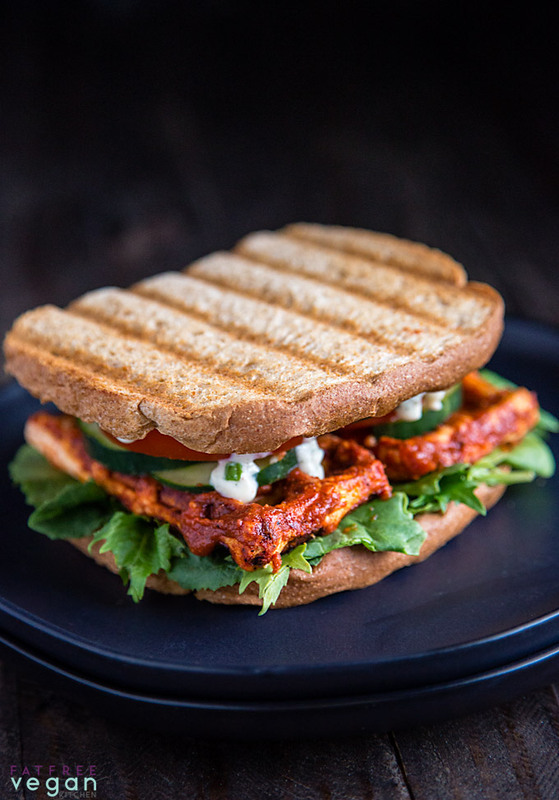 Brush with extra barbecue sauce and serve alone or on sandwiches. 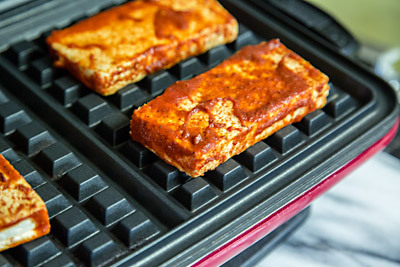 Made with this barbecue sauce, waffle iron tofu is 0 Weight Watchers smart points. If you give it a try, please leave me a note in the comments telling me what seasoning you liked best. 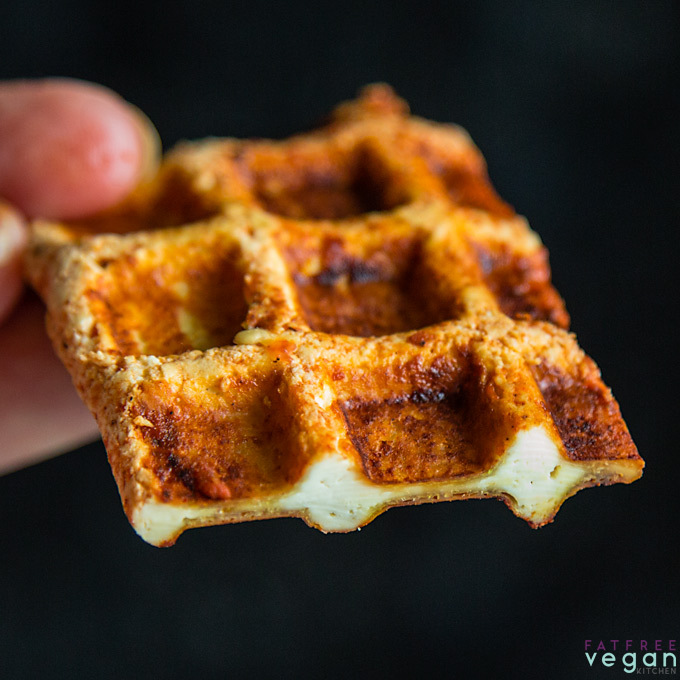 Related Posts of "Barbecued Waffle Iron Tofu | Recipe from FatFree Vegan Kitchen"